The one class I look forward to the most every year at Grace-Marie’s Kitchen is the Holiday Cookie Exchange. It’s the one class I just won’t miss. 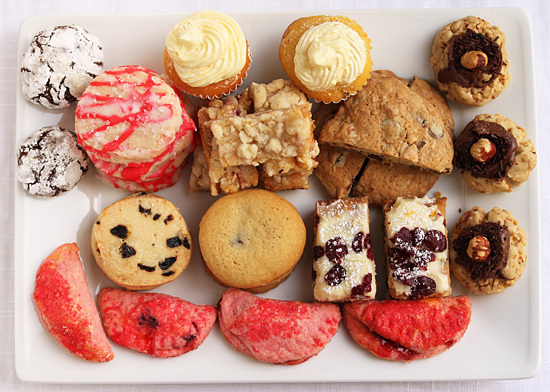 For me it starts the Christmas Holiday time, as I bring home a big platter of many kinds of festive cookies to share with my family. 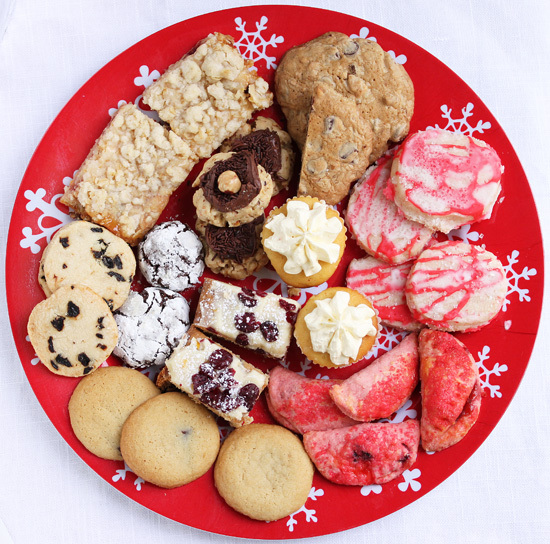 This year Grace-Marie made four different kinds of treats and six students brought their own favorite cookies from home to share. You can see on the plate above how yummy they all look. There is now Happy Holidays Cookie Exchange Part 2, featuring Peppermint Shortbread Thins, White Chocolate Cranberry Blondies, Starlight Mint Surprises, and Cherry Shortbread Cookies. Check them out, too. 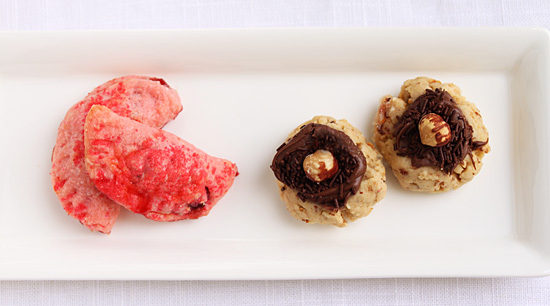 The two cookies I’m going to tell you about today are the Hazelnut-Nutella Kisses made by Grade-Marie, and the Cranberry Delight Cookies made by Margene Schlackman, a friend who came to class. The Hazelnut Kisses are beautifully nutty and the Nutella, which I’m crazy about, is smooth and chocolate-y. What a great combination. The Cranberry Delights are made with a cream cheese dough which bakes up really flakey, and with the piquant Crazen-Cherry preserve filling is really delicious. Not to mention, they are pretty in pink with sparkly red sugar sprinkles. I think you would be proud to have either of these confections on your Holiday buffet. 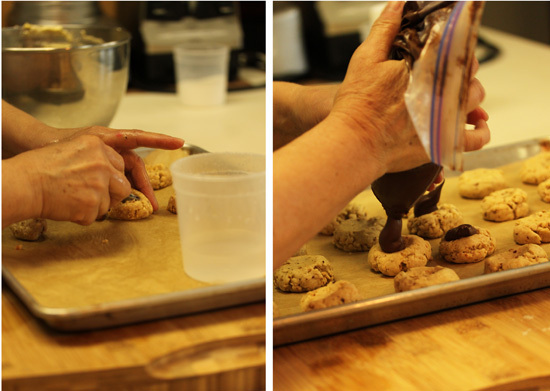 The Hazelnut Kisses are made in the stand mixer and Grace-Marie used a small ice cream scoop to portion out the dough. Then she rolled them between her hands into perfect spheres. Using a measuring teaspoon, she made indentations in the top of the dough balls. 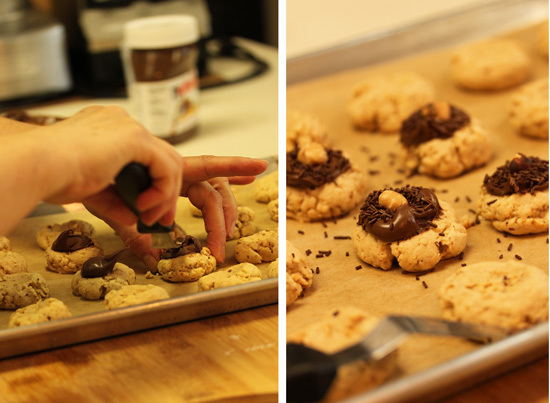 When they were done baking and cooled, the cookies were filled with Nutella squeezed from a zip-top bag. Grace-Marie used an offset spatula to make the Nutella look pretty and then they were dusted with chocolate sprinkles and crowned with a beautiful hazelnut. Perfect. You know what baking cookies smell like in your own kitchen. Imagine that multiplied by ten. That was the Holiday Cookie Exchange at Grace-Marie’s Kitchen. 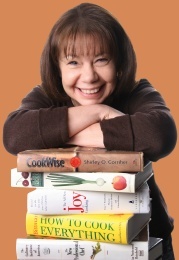 I’ll be giving you the recipes for all of the other cookies in upcoming posts, so stay tuned. Happy Holidays! 1. Preheat oven to 400 degrees F. Line cookie sheet with parchment. 2. Mix together the flour, salt, butter, cream cheese, vanilla and food coloring. Chill the dough. 3. Roll out the dough until it is consistently thin. Cut into 3-inch circles. 4. Put 4-5 Crazens and about 1/4 teaspoon preserves on one half of dough circle. Brush edge with egg, fold over and seal with a fork. Make sure none of filling seeps out. 5. Brush top of cookies with egg and top with sprinkles. 6. Bake at 400 F for 12 minutes. 1. Adjust oven rack to middle of oven and preheat to 350 degrees F. Line 2 baking sheets with parchment. 2. Process flour, hazelnuts and salt in food processor until finely ground, about 45 seconds. 3. In stand mixer fitted with paddle, beat butter and granulated sugar on medium high speed until light and fluffy, 3 to 6 minutes. Add egg yolk and vanilla and beat until incorporated. 4. Reduce speed to low and add flour mixture. Mix until just combined. 5. 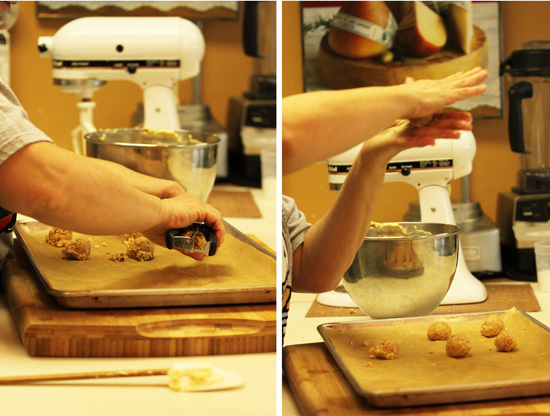 Working with 1 tablespoon dough at a time, roll into balls and space them 2 inches apart on prepared sheets. Using a greased rounded teaspoon measure, make an indentation in center of each ball. 6. Bake 12 to 16 minutes until cookies are jut beginning to brown around edges. 7. Remove cookies from oven and gently reshape indentations with teaspoon measure. Transfer to rack and allow to cool completely, about 45 minutes. 8. Pipe about1 teaspoon Nutella into indentations and smooth with offset spatula. Dust with chocolate sprinkles and press one hazelnut into center. Note: You may alternatively fill indentations with lemon curd and sprinkle with powdered sugar. For this small amount of lemon curd, you may use purchased, preferably Wilkin & Sons.